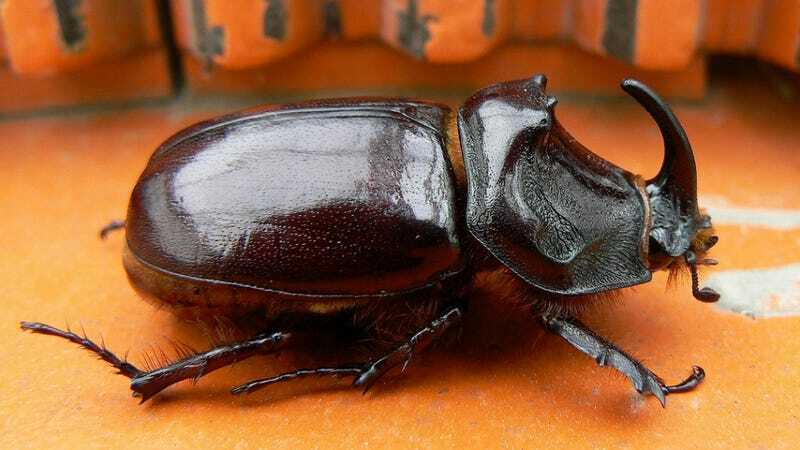 How does the rhino beetle's gigantic horn not totally mess with its ability to fly? Seriously, look at the size of the thing sticking out of that beetle's head, and that's not even the maximum size those things grow to. All male rhino beetles have these giant horns growing out of their heads as a way of showing off their sexual prowess to any female rhino beetles that might be around. Crazy, unwieldy anatomy like this isn't unusual... but the fact that these horns don't seem to present any problems for their owners most definitely is. "Given that males have a giant pitchfork of a horn sticking out of the head, I expected that flying would be cumbersome and awkward. Quantifying flight costs seemed like a good place to start. I was not expecting the horns to have such a small effect on flight. Horns [also] don't appear costly in terms of resource allocation trade-offs, immune costs or survival. So if there are costs associated with carrying and/or producing horns, it definitely isn't obvious what these costs might be." You can check out the whole article here and their original paper in Proceedings of the Royal Society B: Biological Sciences. Image by on e³°°° on Flickr.